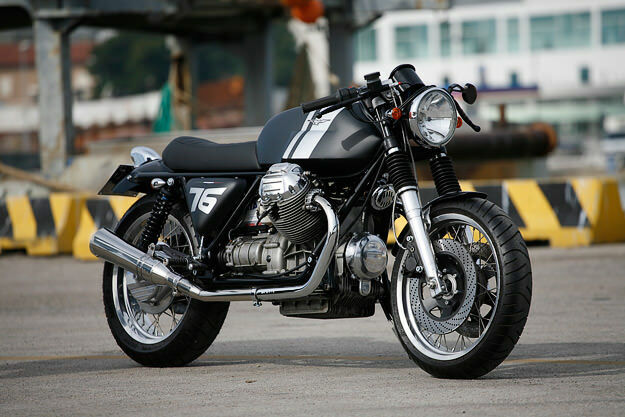 Thirty years ago, if you were looking for a powerful motorcycle to take you from one end of continental Europe to the other, the Moto Guzzi 1000 SP would be near the top of your list. It wasn’t the best-looking bike to roll out of the Mandello del Lario factory. But it did have a bulletproof air-cooled 948 cc v-twin, shaft drive, and 60 long-legged Italian horses that would propel you to over 180 kph. The 1000 SP has always been somewhat overshadowed by the sportier Le Mans, but Filippo Barbacane of Officine RossoPuro has now given the 1000 SP the looks it always deserved. In the space of four months, he’s turned the ultimate Italian sports tourer into a stunning contemporary café racer—and in the process, upgraded the mechanicals too. The engine is now fitted with heads from the Le Mans 1000, and connected to a custom Officine RossoPuro exhaust system. The original forks have had progressive springs installed, with damping at the rear taken care of by adjustable shocks from Mandello neighbor Asatek. Custom Officine RossoPuro brake rotors are squeezed by Brembo callipers, and the bars and foot controls are from Tarozzi. The bodywork is all-new too, flaunting traditional Guzzi styling signatures such as the creased tank and the v-shaped section under the new seat. The overall effect is molto bella; the perfect marriage of classic Italian style and subtle modern updates. The lucky new owner of this bike is Mario Natale from Belgium, but Filippo has two more in the works. And wouldn’t you like one of them in your own garage? Head over to the Officine RossoPuro website if you’re interested. [See more images of this beautiful motorcycle in the photo album on our Facebook page.